Nursing mother should adhere to certain principles of nutrition, especially if the baby was born recently. On the one hand, the food should be healthy and varied, that the child receives all the necessary substances. On the other hand, foods eaten by the mother can cause the child's allergies and cause increased flatulence and problems with the belly. 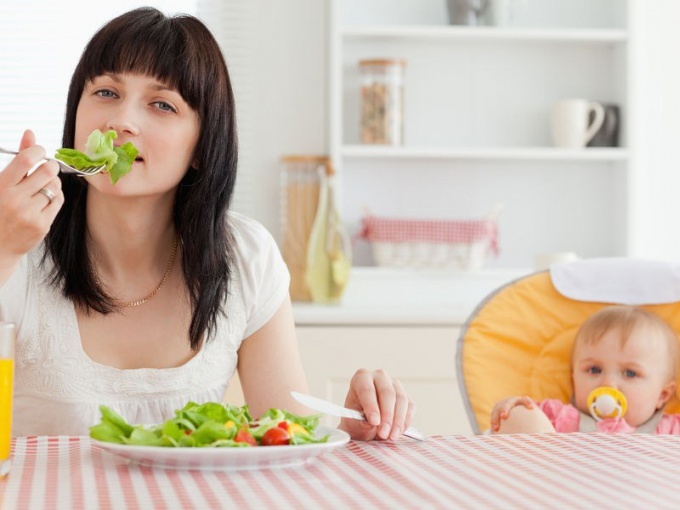 Therefore the mother should be attentive to the choice of ingredients for the salad. The first 2-3 months the woman should avoid foods that may cause allergic child. These include seafood, nuts, citrus, eggs, mayonnaise and soy sauce. Contrary to popular belief, bright vegetables, such as carrots and beets, it is possible. In the first months of a child's life it is better to exclude from a diet of tomatoes and exotic fruits and vegetables. Dairy products should be limited, but a spoon of sour cream or a few cubes of cheese in a salad is acceptable. The relationship between nutrition of the mother and colic in the child not so much clear. Colic – physiological process of maturation of the intestine, and it is impossible to adjust due to the food. However, the food of the mother may lead to increased flatulence of the baby and it will significantly increase pain. To predict what the child will become swollen belly, almost impossible. First of all, focus on yourself: if the mother complications from taking a specific product, almost certainly the baby's tummy will react similarly. The most common culprit in gas: beans, cabbage and potatoes. However, individual intolerance of products can be identified only experimentally. Thus, up to 3 months you can eat the following salad: cooked beets with garlic, carrot salad with Apple, salad of fresh vegetables with herbs (no tomato), a salad of boiled beef with boiled carrots and pickles (homemade): blank. These dishes can sour cream or vegetable oil to your taste. If you are behind a festive table and wish to eat harmful conventionally salad, for example, "Olivier", you can afford 1-2 tablespoons. If the child is older than 3 months, and he had no allergic reactions to food, gradually start to enter into your diet products which I had previously declined. Thus, for half of your kid almost all restrictions on your food will be removed. During this period, your menus can be salads containing nuts, eggs, chicken, tomatoes and other previously prohibited foods. But to add to the dish immediately 2 new product should not be. Otherwise, if the child will have an allergic reaction, you will not be able to determine its cause. You can try the following salads: vegetable salad with tomatoes; salad with cucumber, homemade pickles; salad of cucumber, radishes, eggs and green onions with sour cream; cabbage salad with carrots, bell peppers and onions.